A city near Tokyo declared a state of emergency and ordered thousands of residents to evacuate after torrential rain caused severe flooding. The storm caused contaminated water from the wrecked Fukushima nuclear plant to leak into the ocean. The Kinugawa river, which runs through the city of Joso, about 26 miles (42 kilometers) north of Tokyo in Ibaraki prefecture, broke its banks at about 12:50 p.m., public broadcaster NHK said. TV footage showed houses being dragged away by the flood and helicopters airlifting people from homes in danger of being swept away. Nearly 300 homes were flooded as of 2:25 p.m. local time, according to a statement by the Fire and Disaster Management Agency. Kyodo News reported that 2,500 people had been evacuated in Joso, with 39 rescued by the Self-Defense Forces. One person has been reported missing, Chief Cabinet Secretary Yoshihide Suga told reporters in Tokyo. Contaminated water at Tokyo Electric Power Co.’s Fukushima Dai-Ichi facility leaked into the Pacific Ocean at about 12:30 a.m. on Wednesday, company spokesman Tatsuhiro Yamagishi said by phone, adding that company is still investigating the leak. Nissan Motor Co. spokesman Dion Corbett said there was no major impact on its plant in nearby Tochigi prefecture, which has also declared state of emergency. Tropical storm Etau passed over Japan’s main island of Honshu into the Japan Sea on Thursday, but heavy rain may continue over Japan’s northeastern coast, according to Japan Meteorological Agency’s Eiju Takahashi. A second tropical storm is tracking behind and is expected to head toward Japan’s northeastern coast and parts of Hokkaido. Heavy rain should cease in Japan’s Kanto region, where the capital is located, but the area must stay on alert for floods and landslides due to ground loosening, Takahashi said. 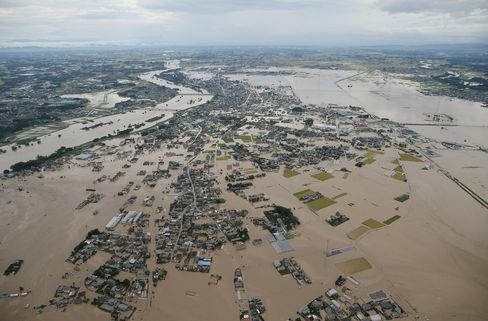 One area of Tochigi was estimated to receive more than 500mm of rain over a 12-hour period, he said.